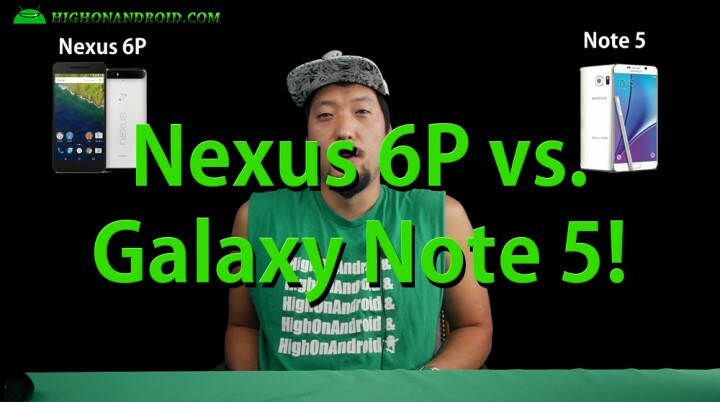 Nexus 6P vs. Galaxy Note 5! Can’t decide between Nexus 6P or Note 5? Let us help you look into details of the differences between the two. Google has finally released the official Nexus 6P, which is Google’s latest premium smartphone for the masses, let’s go take a quick look at Nexus 6P versus the Galaxy Note 5 based on specs. First, both Nexus 6P and Note 5 ship with 1440P AMOLED screen with screen resolution of 2560 by 1440 pixels. Now, the AMOLED screens used on the 6P and Note 5 may be different, that we will have a full report when we get hands on it but for right now, Nexus 6P and Note 5 both have equally great screens. Second, Nexus 6P uses Qualcomm Snapdragon 810 v2.1 processor while the Note 5 uses Exynos 7420. For raw CPU power, the Exynos 7420 on the Note 5 is 20-30% faster but the Nexus 6P should also be plenty fast and don’t forget it’s got pure Google OS so you will see less lags than TouchShiz. Also, Note 5 has a whopping 4GB of RAM while Nexus 6P has 3GB, Note 5 may be much better for graphic-intensive apps and games. We will have to give an edge to the Note 5 for performance. Third, Nexus 6P ships with latest Android 6.0 Marshmallow while Note 5 is still on Android 5.1.1 Lollipop. Until Note 5 gets upgraded to Android 6.0, Nexus 6P will definitely have a big advantage in terms of performance and battery life so Nexus 6P wins for better overall OS and quicker OTA updates. Fourth, Nexus 6P features a new type of fingerprint sensor located on the back of the phone plus Android 6.0 Marshmallow is optimized for fingerprint sensor while Note 5 has a fingerprint sensor in the center home button with very fast unlocking speeds. The Note 5 fingerprint sensor is one of the best in the world but the 6P does have and advantage with its fingerprint sensor location where it’s easier to unlock your phone so we will have to say the Nexus 6P is the winner. Also, the Nexus 6P features Android Pay which requires NFC while the Note 5 features Samsung Pay which doesn’t require NFC and works with many more older credit card readers. Note 5 certainly wins in the future of mobile payments. Fifth, Nexus 6P features 12.3MP camera and a camera sensor size of 1.55 microns (or micrometers) that supposedly have much larger sensor per pixel than Note 5 with aperture of F2.0. Note 5 has 16MP camera with F1.9 lens. This is going to be a very close race and it will boil down to which camera takes better photos in low light. The Nexus 6P will also do 240fps slow motion while the Note 5 features 120fps. For now though, we will say they are both equal in terms of camera performance based on the specs. Sixth, Nexus 6P features a whopping 3450mAh battery while Note 5 only has 3000mAh. Nexus 6P is definitely going to beat the Note 5 in terms of battery life in my opinion so the 6P wins for longer battery life. Seventh, Note 5 features S-Pen which allows you to draw art, notes, and adds a whole new level of writing experience on a smartphone while Nexus 6P has none of those features. For people who absolutely need S-Pen features, the Note 5 wins hands-down, it has the best stylus on a smartphone period. Eighth, the Nexus 6P is an all-carrier device that can be used on AT&T, T-Mobile, Sprint, Verizon, and Google’s own Google Fi network while Note 5 is carrier-specific. Nexus 6P is definitely the winner as fully unlocked phone, especially for those of you on AT&T or Verizon as it has no locked bootloaders unlike Note 5 models. Nexus 6P is clearly the people’s phone that let’s you be in full control over your phone. Ninth, the Nexus 6P has a full stereo dual speakers on the front while the Note 5 has just one mono speaker. Nexus 6P wins for better speakers. For pricing, Nexus 6P is sold for just $499.99 for 32GB model while the Note 5 starts at $699.99. With a $200 difference, the Nexus 6P may just well be the best phablet on earth with better battery life, better fingerprint sensor, and better OS than the Note 5. If the camera holds up near the Note 5, I think the Nexus 6P may be the new best phablet in the world minus the S-Pen. If you absolutely don’t need S-Pen features, the Nexus 6P offers pretty much everything the Note 5 does at a lower price with better battery, better fingerprint, better OS, and better carrier compatibility. Overall, Nexus 6P is definitely lookin’ very promising but I will have a full hands-on review once my order arrives next month. Don’t forget to hit the thumbs up for me if you enjoyed this quick comparison and as always stay HIGH on Android! Next story Nexus 6P vs. iPhone 6S Plus! Previous story Nexus 6P vs. Nexus 5X!